One of the more prolific and influential analysts of multilateral approaches to global problem-solving over the last three decades is Thomas G.
Weiss. 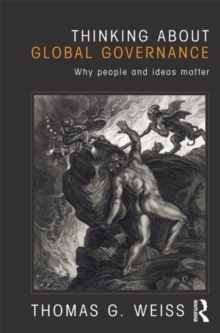 Thinking about Global Governance, Why People and Ideas Matter, assembles key scholarly and policy writing. This collection organizes his most recent work addressing the core issues of the United Nations, global governance, and humanitarian action. The essays are placed in historical and intellectual context in a substantial new introduction, which contains a healthy dose of the idealism and ethical orientation that invariably characterize his best work. This volume gives the reader a comprehensive understanding of these key topics for a globalizing world and is an invaluable resource for students and scholars alike.